The job of a school principle comes packed with responsibility. This holds especially true if you’re in charge of a secondary school. Not only must you ensure your school’s faculty are all doing their proper jobs, but you must also help to guide a group of students closing approaching one of the biggest transitions of their lives: moving on from high school and into college, trade school, or the workforce. Because you have such a large job on your hands, the state of Oklahoma wants to ensure you have all the necessary training and knowledge. This is why all incoming secondary school principals are required to take and pass the OSAT Secondary Principal Comprehensive Assessment test. Like your future career, this important exam is highly multifaceted. To prepare properly for it, you’ll need a comprehensive study tool to help you. Our team at Mometrix Test Preparation would like to present you with our OSAT Secondary Principal Comprehensive Assessment (047) practice test. Designed with accuracy in mind, this free resource is meant to serve as a means of helping you familiarize yourself with the test well before exam day actually arrives. 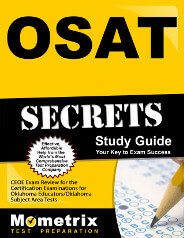 Like the real exam, this practice test is a bit shorter than the standard OSAT exam. It features only 52 OSAT Secondary Principal Comprehensive Assessment practice questions. Two questions fall under the essay portion of the test, also known as “constructed-response.” This section of the exam accounts for only 30 percent of the exam’s full content, with one question making up 20 percent of the section and the other 10 percent. 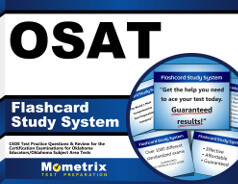 While our OSAT Secondary Principal Comprehensive Assessment practice test is already an effective resource when used standalone, it works best when used in conjunction with our companion study guide. Regardless of how you use it, we hope it will help guide you more easily on the path to success. Good luck!